Following a third-place finish in the boys' 17-18 division of the 400m at the AAU Junior Olympic Games on Saturday, Hasani Barr was, for all intents and purposes, all smiles. It was just the fourth race of 2018 for the Cardinal Ritter (MO) High School soon-to-be senior, and the most healthy he had felt since 2016. 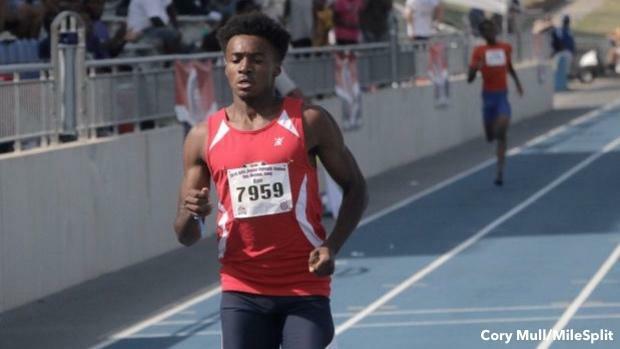 He ran 47.99, breaking 48 seconds for the first time since May of 2017, and he had looked pretty good doing it, rolling to the finish behind just Dominick Yancy (47.86) and Tyrese Cooper (46.02). But in truth, it didn't come without some major struggle. Barr hadn't run his entire spring season and had been injured for much of his sophomore campaign, too. "Freshman year I was one of the top 400m runners in the country and my sophomore year I got hurt and then I missed my whole junior season," he said. In 2017, as Barr was following a national-level freshman season that saw him produce the third-fastest 400m time in the country for his grade, he sustained a lower body injury that, in retrospect, probably should have shut him down. But the Missouri native ran through it as a sophomore, grabbing a season-best of 47.57 at districts in May before nabbing an AAU Junior Olympic Games title two months later in the boys' 15-16 category in 48.91 seconds. From there, however, the injury took over. "I had support, but those were real dark times where I needed some people and I had to county on myself and pick myself up some times," he said. Throughout the process back to health, though, Barr said he remained positive. "Getting back on the track, everybody was running fast and I wanted to run fast, too," he said. Barr had to learn some important things while he was out. Chief among them, he said, was efficiency. "My technique and just how I run the race, it's a lot better," he said. "I'm a lot smoother. Yesterday I was running fast, but I didn't use a lot of energy to run fast." He also learned how to cherish the moment. "Don't be too serious," he said. "Being hurt, I was stressing and trying to run fast, getting down on myself, but I had to realize I"m not going to run high school track for long. I have four years. Enjoy it while it's there." With one more year left in high school, Barr was excited about the promise of his best season yet.